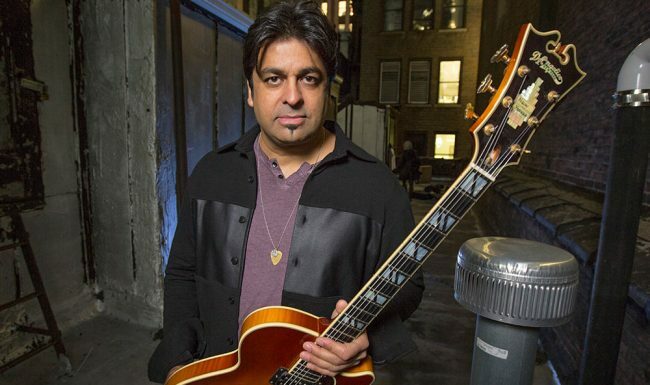 Voted #1 Rising Star Guitarist in the 2013 DownBeat Critics Poll and placed in the “top-ten Guitarists” in 2015’s poll, Rez Abbasi continues to push boundaries. Rez is musical director, arranger and producer for Indian/Canadian multiple Juno award winning vocal sensation, Kiran Ahluwalia. Kiran’s 2008 recording, “Wanderlust” was in the top ten European world-music radio charts and also was among the top-ten albums of 2008 in Song-Lines Magazine. Another of Abbasi’s highly regarded associations is with heralded saxophonist, Rudresh Mahanthappa. Rez plays an integral role in Mahanthappa’s Indo-Pak Coalition and Kinsmen Ensemble. Rez can also be heard as a member of many others projects. With twelve albums of mostly original compositions under his belt, Abbasi continues to find new groups of musicians to help his musical vision come to life. His 2005 recording Snake Charmer, created a stir in the music world partly due to his organic, original approach in blending two complex musical genres together, namely jazz and Indian music. The provocative instrumentation of organ, drums and guitar alongside Indian vocalist Ahluwalia, is on one hand, a sound grounded in jazz and yet uncommon in jazz arenas. 20th Century Guitar reviewed the CD as, “One of the best examples yet of how to merge Indian Classical music with jazz…Snake Charmer really breaks new ground.” In 2007, Rez achieved even greater heights with the follow up to Snake Charmer, Bazaar. Bazaar continues the group’s journey through territories unheard in today’s jazz/world music scene. Abbasi’s sixth album, Things To Come (Sunnyside, 2009) is yet another leap into unchartered musical territory. It features a star studded group of Vijay Iyer, Rudresh Mahanthappa, Kiran Ahluwalia, Johannes Weidenmueller and Dan Weiss and was included in DownBeat’s top CD’s of the decade. The same year he was awarded the prestigious Chamber Music America Grant as a commission to compose new works for the same ensemble, Invocation. 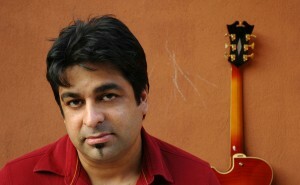 At the end of 2009, Abbasi formed a new quartet. The Rez Abbasi Acoustic Quartet, or RAAQ, was conceived for the purposes of featuring Abbasi’s acoustic guitar talents. 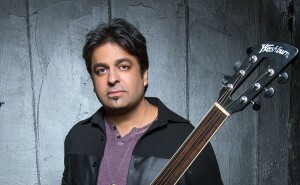 Simultaneously, it serves as an outlet to feature his compositions alongside “gems from other composers that are rarely heard today.” Abbasi was well aware of creating a group that would magnify and enhance his acoustic guitar sound – calling upon vibraphonist, Bill Ware (Steely Dan), bassist, Stephan Crump (Vijay Iyer Trio) and drummer, Eric McPherson (Andrew Hill). RAAQ’s debut, Natural Selection (Sunnyside, 2010) captures the profound sensitivity of the ensemble as it twists and turns through the set, featuring the standout textural cascades created between acoustic guitar and vibraphone. The album was included in JazzTimes’ and NPR’s ‘best of’ the year lists and the New York Times did a feature review of the CD release concert. RAAQ performed at the 2010 Newport Jazz Festival which was recorded and broadcasted several times on NPR’s JazzSet with Dee Dee Bridgewater. Abbasi soon re-employed his acoustic quartet, RAAQ for another album. Intents & Purposes (enja, 2015) acoustically recasts classic jazz-rock music from the ‘70s, a genre Rez initially was not a fan of due to its over use of synthesizers. He used a fretless guitar to highlight his love for micro-tonality. Rez was featured in the Wall Street Journal, DownBeat and JazzTimes. In the summer of 2016 Abbasi will release an album with his new group, Junction. Behind the Vibration(Cuneiform), is the inverse of Intents & Purposes in that it is a full-blown electric album of all originals. With Mark Shim on tenor sax & midi wind-controller, Ben Stivers on keyboards, B3 & Rhodes, Kenny Growhowski on drums and Rez employing overdrive and effects, the music moves in very unpredictable ways. Abbasi’s most recent album, Unfiltered Universe (Whirlwind Records) finds him back in the company of his group Invocation. The band is comprised of jazz luminaries, Rudresh Mahanthappa, Vijay Iyer, Johannes Weidenmuller and Dan Weiss while adding cellist Elizabeth Mikhael. It’s the third album of the trilogy Abbasi set out to record starting from Things to Come from 2008. Unfiltered Universe received top 50 best albums from NPR along with countless positive reviews the world over.